Over the past two weeks, four Minnesotans in their early 20s were reported missing in separate cases in Minnesota and Wisconsin. Investigators have tried to link the four cases, but only a very thin thread can hold them together. All four were college students, last seen leaving either a bar or party. Authorities say they cannot recall this many cases of missing adults within such a short time span. The Early Show spoke with the parents of Chris Jenkins, one of the four missing students. Steve and Jan Jenkins say their son was last seen leaving a Halloween party at the Lone Tree Bar & Grill in downtown Minneapolis. Eyewitnesses say the University of Minnesota student was outside in 20-degree weather, wearing his American Indian costume around midnight. According to reports, the costume did not have pockets; therefore, he was not able to carry his wallet, nor his keys and cell phone. His friend, Ashley Rice, carried his possessions for him. No one realized Jenkins was missing until Rice arrived at Jenkins's apartment to return his possessions the next morning. The Jenkins family has offered a reward for up to $50,000 for any information on their student's whereabouts. They also have created a Web site at www.findchrisjenkins.com and are asking for information or donations to help them find Chris. For now, authorities are handing the four missing cases as separate incidents. Erika Dalquist: Missing since Oct. 30 from Brainerd, Minn., about an hour northwest of Minneapolis. The 21-year-old union steward was last seen in downtown Brainerd at the Tropical Nites bar, which she left with an unidentified man. Christopher Jenkins: A 21 year old missing since Oct. 31 (Halloween) from Minneapolis. He vanished after he left a downtown bar in the early hours of Nov. 1. The University of Minnesota lacrosse goalie and Eden Prairie native was last seen in his American Indian Halloween costume. Michael Noll: A 22 year old Minnesotan who disappeared Nov. 6 when he left an Eau Claire, Wisconsin, bar just before midnight after celebrating his birthday. The University of Wisconsin-Eau Claire student was last seen "highly intoxicated" by an elderly woman who said he mistakenly walked into her house near the Chippewa River, then left. 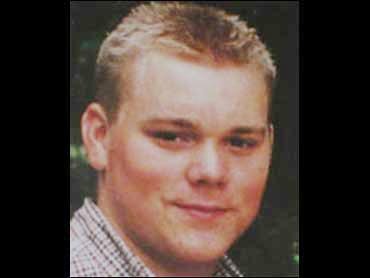 Joshua Guimond: A 20 year old who disappared Nov. 9. The St. John's University student and Maple Lake, Minn., native was last seen about midnight leaving a Collegeville party where alcohol had been available. If you have any information on Chris Jenkins's disappearance, call 6612-849-1031 or dial 911 and ask for Minneapolis police.